Gettysburg Licensed Battlefield Guide Dr. Richard Goedkoop is the host for the Iron Brigade series. 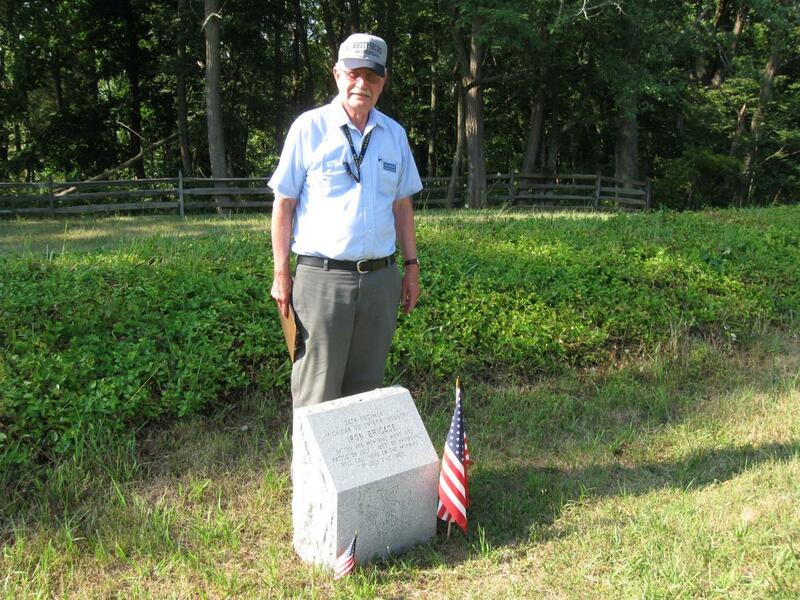 He is standing on Stevens’ Knoll by the marker for the 24th Michigan Infantry Regiment. This view was taken facing northeast at approximately 6:15 PM on Saturday, July 17, 2010. Gettysburg Licensed Battlefield Guide Dr. Rich Goedkoop is the host for a series on Iron Brigade of the United States’ Army of the Potomac. He is a professor of Communication at LaSalle University. Rich began his professional career in education as a Graduate Assistant at Central Michigan University. He received his Masters there in 1977 and went on to Pennsylvania State University to receive his Doctorate in 1980. Rich joined La Salle that same year. Throughout his career, Rich has taken an active interest in news and public affairs television programming which inspired his book, Inside Local Television News (1988). His numerous reviews and articles have appeared in such publications as Journalism Quarterly, The Journal of Broadcasting, Feedback, and Critical Studies in Mass Communication. Dr. Goedkoop was the host for our series on John F. Kennedy’s visit to Gettysburg. In our first Iron Brigade post, Rich Goedkoop introduced us to the Iron Brigade series, explained how the unit was organized at the beginning of the war, and described their distinctive uniform. In the second Iron Brigade post, Gettysburg Licensed Battlefield Guide Richard Goedkoop explains how the Iron Brigade acquired its nickname, and discusses their actions in the battles of Brawner’s Farm and Antietam. In the third Iron Brigade post, Gettysburg Licensed Battlefield Guide Richard Goedkoop described the makeup of the First Division of the First Corps, and in particular, the 6th Wisconsin. In the fourth Iron Brigade post, Gettysburg Licensed Battlefield Guide Richard Goedkoop briefly presented the rest of the regiments of the Iron Brigade and their commanders. In the fifth Iron Brigade post, Richard Goedkoop showed the direction that the Iron Brigade took across the Codori Fields, where they entered McPherson’s Woods, and where they captured members of Archer’s Brigade. In the seventh Iron Brigade post, Licensed Battlefield Guide Richard Goedkoop shows the retreat of the Iron Brigade on the afternoon of July 1, 1863, from McPherson’s Woods to Seminary Ridge. In the eighth Iron Brigade post, Gettysburg Licensed Battlefield Guide Richard Goedkoop shows the locations where the Iron Brigade made their stand on Seminary Ridge on the afternoon of July 1, 1863. In today’s Iron Brigade post, Gettysburg Licensed Battlefield Guide Dr. Richard Goedkoop shows the final position of the Iron Brigade on the west slope of Culp’s Hill, and concludes the series on the Iron Brigade. This map shows the location of the videos for Iron Brigade posts. Videos #1-#25 were shown in our previous Iron Brigade posts. Videos #26-#28 were taken north of Slocum Avenue in the area where Culp’s Hill meets Stevens’ Knoll. This map was created facing north at approximately 3:00 PM on Saturday, December 25, 2010. 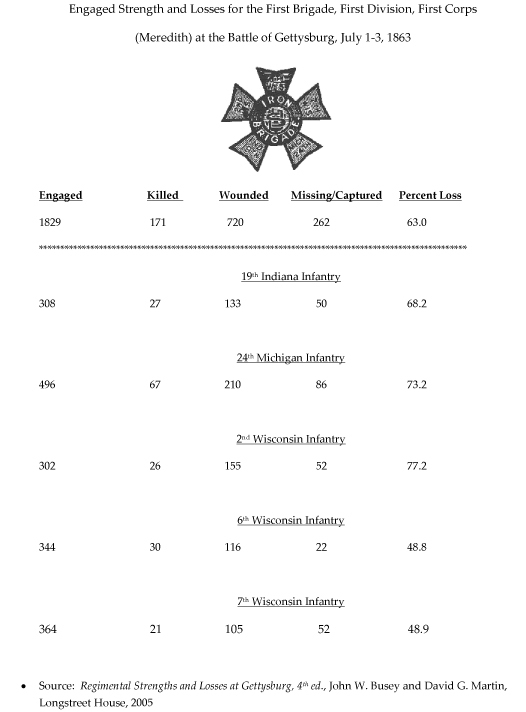 The 24th Michigan marker at the unit’s position on July 2nd and 3rd, 1863 shows the amount of casualties suffered on July 1, 1863. 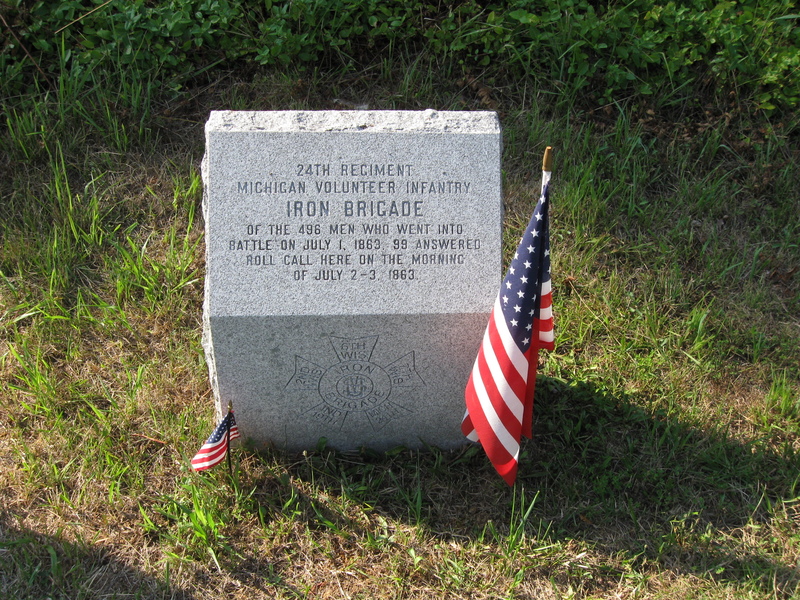 At the bottom of the marker is the Iron Brigade “symbol” showing the units that composed the brigade. This view was taken facing north at approximately 6:15 PM on Saturday, July 17, 2010. 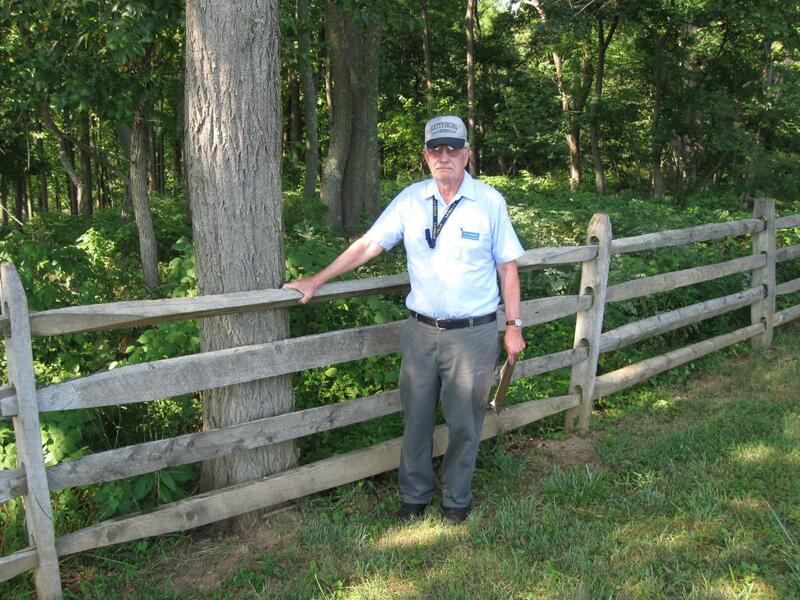 In Video #26 (Videos #s 1-25 were shown in our previous Iron Brigade posts) Gettysburg Licensed Battlefield Guide Rich Goedkoop is standing by the marker to the 24th Michigan in an area where Stevens’ Knoll meets the western slope of Culp’s Hill. He explains that the only Iron Brigade unit to see significant action on Culp’s Hill was the 6th Wisconsin. This view was taken facing northeast to southwest to east to northeast to east at approximately 6:15 PM on Saturday, July 17, 2010. 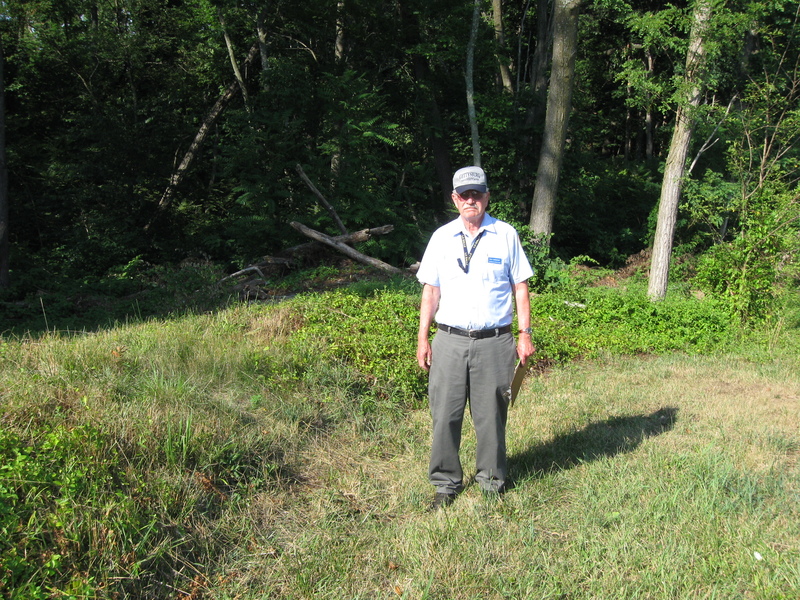 Licensed Battlefield Guide Richard Goedkoop is standing on the west slope of Culp’s Hill by a reconstructed earthwork marking the position of the 24th Michigan on July 2nd and 3rd, 1863. This view was taken facing northeast at approximately 6:15 PM on Saturday, July 17, 2010. In Video #27 Licensed Battlefield Guide Rich Goedkoop is standing on the west slope of Culp’s Hill. He sums up the Iron Brigade’s action on July 1, 1863. This view was taken facing northeast at approximately 6:15 PM on Saturday, July 17, 2010. Dr. Richard Goedkoop is standing on the west slope of Culp’s Hill near Stevens’ Knoll. This was the position for most of the Iron Brigade on July 2nd and 3rd, 1863. This view was taken facing northeast at approximately 6:15 PM on Saturday, July 17, 2010. 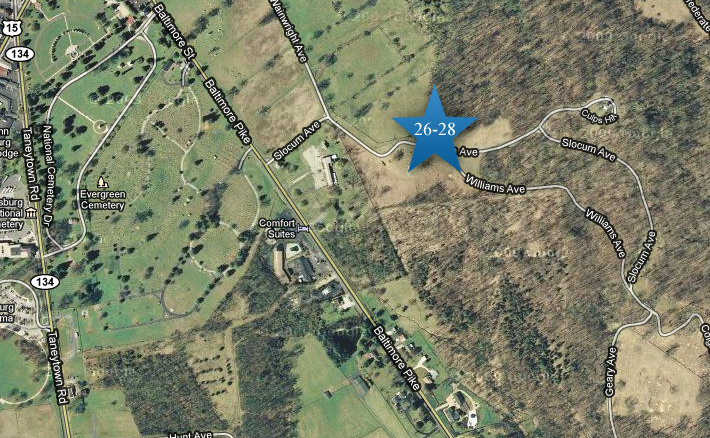 In Video #28 Dr. Rich Goedkoop is standing on the west slope of Culp’s Hill near Stevens’ Knoll. He closes the Iron Brigade series. This view was taken facing northeast at approximately 6:15 PM on Saturday, July 17, 2010. 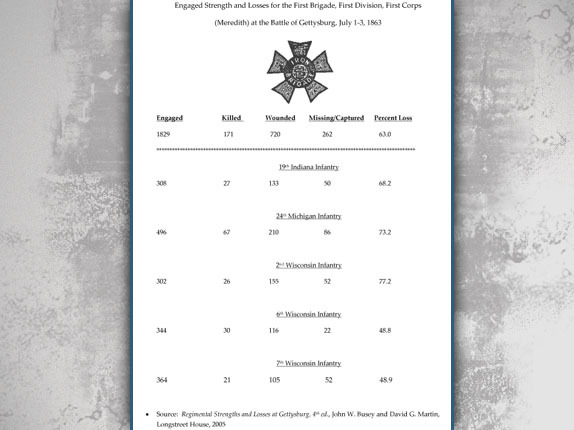 Some statistics from the Iron Brigade’s action at Gettysburg.